Jane is an extremely popular pattern designer, and one of my first favorites when I took up the craft, so I was thrilled when she jumped into that knitalong, sharing that it was her first time doing stranded colorwork! Rather than knitting a vest, she opted to knit more of the classic zip-front jacket — albeit top-down raglan rather than drop-shouldered. Demand for the pattern ensued, followed by a year or so of pattern-writing and testing all that, and it’s now the subject of its own knitalong. The pattern also includes blank charts if (like me) you’re wanting to create your own motifs. Whitney (most recently noted for Stone Wool) also opted to knit a cardigan that was a huge crowd-pleaser, while being a little more loosely Cowichan-inspired. This one is bottom-up seamless, with a more traditional shawl-collar — and a steek! — and is bulky gauge rather than superbulky, so some might find it a little more wearable. I can’t see any reason why I shouldn’t knit one of each! UNRELATED SHOP NEWS: We’ve got the new issue of Koel Magazine; the new KnitWit with article by yours truly; the latest volume of Brooklyn Tweed’s Capsule books, by Michele Wang; a fresh stack of Jared’s book; the newly repackaged Stowe Bag pattern; all five colors of the Field Bag in stock at the same time, along with Porter Bins; a new batch canvas wax and cleaner (sold separately) … the list goes on! Find it all at Fringe Supply Co. ABOVE: The grand prize winner — who’ll receive a $100 gift certificate to Fringe Supply Co. — is Ella Gordon. We talked a lot during this knitalong about cultural sensitivity issues relating to the appropriation of the Cowichan style. Ella was working from a different Japanese pattern, which had teepees as the main motif. If you’re familiar with Ella, you know she is a serious student of knitting traditions and a collector of sweaters from across all of them. She also lives in Shetland, not the PNW, and teepees have no particular cultural meaning for her. So for all of those reasons, she replaced the teepees with the croft houses that dot her own native countryside. I found it both clever and touching, and her finished vest is just fantastic. You can read all about it and see more photos on her blog and her Instagram feed, @ellalcgordon. Jess Schreibstein, above, played around with much more ambitious and traditional motif ideas before settling into a minimalist version of a Cowichan-inspired vest. She tackled the Cowichan method of float-trapping* — I’m so happy about how many people took this on! — and wound up with a garment that’s totally her own and looks great on her. For lots more gorgeous pics of this vest in progress, see her Instagram feed, @thekitchenwitch. At a glance, Claire Allen-Platt’s finished vest looks like a great garment that’s pretty true to the pattern (and obviously I approve of her color usage!) but I think she’s one of only two (?) people to knit it in the round and steek it. She also tweaked the motifs a tiny bit to make the main one a little less snowflake-like — and it fits her perfectly. Tweaked and steeked, I like it. See her Instagram feed for more, @claireallenplatt. Ladies, send me an email (karen at fringeassociation) to collect your prize! If you haven’t seen the full feed, check out #fringeandfriendskal2015 on Instagram, where you’ll get to see @nappyknitter’s socks, @luckypennyknits’ dog sweater, original designs by @carolsundayknits and @whit_knits, and so much more. And like I said, it’s never too late to jump in. We still have two more panelists to hear from! *See the video tutorials linked in this post. You knitted your vest with three strands of worsted (Quince’s Lark) at a tighter gauge than the pattern called for in order to get the size down a little. How’d that work out? It worked out perfectly! I think the density of the fabric is sort of Cowichan-like — outerwear grade. I also cut 14 rows out of the pattern (the first 14 rows above the ribbing) in order to make it proportionally shorter. It is quite fitted, just what I was after, so not very Cowichan-like in that regard, but I love the fabric and the shrunken fit. Your one trepidation going into this was working the colorwork flat, and specifically whether you’d remember to read the charts back and forth. How did it go? This vest turned out to be an amazing learning experience. I not only worked the colorwork back and forth, but I decided I wanted to learn the Cowichan method of trapping floats (I watched the videos linked in this post) and it really was like learning to knit all over again. I was not only holding one yarn in each hand — as I always do with colorwork — but I really had to get the hang of the left hand, to the point of purling with that hand, which I’ve never grasped. But learning the four different ways to work a stitch, depending on whether you’re knitting or purling, trapping the right-hand or left-hand color, was such a fun challenge. I actually enjoyed it so much I want to do it again really soon, so as not to lose track of that new skill. Plus I just really want another one of these. Here’s the funny thing about my fear that I wouldn’t read the charts right: I recharted the front left panel to work out my motif changes and my shaping changes, but when it came to the right front, I didn’t want to take the time to draw another one. So I actually wound up reading the left-front chart backwards in order to knit the right front, and by some miracle it wasn’t confusing at all! I felt totally brilliant. In the Meet the Panel post, I think you said you were only going to work the checkerboard stripes with the main motif in between, and skip the rest. What changed? Once I had worked that much of the back, I realized if I didn’t add in the upper motifs, it would look too much like a wallpaper border wrapped around me, and not at all like a Cowichan. I wanted it to be funkier and not pretty, so I went ahead and added the stripes and chain-link motif on the upper part of the sweater. I still think it’s a little on the pretty side. You said you recharted for the sake of your shaping changes — what’s that about? I initially was planning to do the squared off armholes like the pattern but decided I really wanted them to lay nicely given my shrunken fit, and same with adding shoulder shaping. I also decided to not knit the garter stitches at the armhole edge. (My plan was to pick up stitches to work armhole edging but I haven’t done anything at all with the armholes yet, and may never.) So at the armholes, I bound off 2 sts for 2 rows and then 1 st for 6 rows. And for the shoulders, I bound off 5 sts each for the last 4 rows, then bound off the neck sts. That was for the back. The fronts were slightly different because I added a selvage stitch at each edge so I could work mattress stitch as normal, rather than through the centers of the stitches as the pattern seems to expect. So then I just bound off 3 sts on the first armhole row instead of 2. What else did you change? The biggest modification I made was to do a zipper instead of buttons. In looking at some zippered Cowichans online, I decided to do the front edges as a slipped stitch plus one stitch worked in garter. Instead of a 4-stitch buttonhole band overlapping a 4-stitch button band, I needed it to be a total of 4 sts — 2 per side instead of 4 per side. That meant I had to make up those two stitches in each of the collar flaps, which was no big deal since, as written, you skip the increase a couple of times. So I just increased more often until I had the right number of stitches. You can kind of see the shaping and edging changes in my chart, which I’ve included a photo of below. Installing the zipper was another chance to learn something new, and I’m thrilled with what the zipper does for the vest. I now want to put zippers on everything. I found this awesome tip about how to stabilize the edges and probably would not have completed the task were it not for that. So thank you, Splityarn. Watching all of the vests appear on Instagram over the course of the knitalong, is there anything you wish you’d done differently? I really love all of the dark ones and kind of wish I’d used black as my MC and the grey and ivory as the CCs. Or that I had used a natural/undyed light grey, which would have been a little more rustic looking. I also love @wendlandcd’s oversized version with the mega collar and want one like that. But I also can’t stop thinking about Andrea’s black side-bursts. I think my next one — and there WILL be a next one! — will be a slightly less fitted, oatmeal-colored, with spare black motifs, one of which might be Andrea’s bursts. The other thing I’ll do differently on the next one is learn the true Cowichan way of forming the collar. I can’t wait! Our second Cowichan-style Knitalong panelist with a finished vest is Amirisu editor Meri Tanaka, with her sprightly colored interpretation. Below she talks about what worked out for her, what didn’t, and how she embraced it all. For more from Meri, follow her on Instagram and the Amirisu blog. And if you missed our earlier Q&A about how to read a Japanese knitting pattern, make sure you check that out! You knitted your vest with a single strand of Puffin (bulky) to get the size of the vest down. How did you like doing the colorwork with Puffin, and how do you feel about the fabric for this pattern? Oh, I love the fabric! If I had been knitting in a tighter gauge, or in the round, it would have been much easier. Because I wanted to maintain the puffiness of the fabric, for the yarn to bloom when blocked, it was very challenging to keep the stitches even on the wrong side. You mentioned you were struggling a little bit with the stranding from the purl side when swatching and I wonder whether you got the hang of it over the course of this vest. Were you trapping your floats Cowichan-style, i.e. trapping every other stitch? Or how did you do it? I did get used to it toward the end, but it required a lot of trial and error. I knitted the back panel in Cowichan-style trapping, about half of it, but was not very happy with the result. The stitches tend to get uneven this way, because of my moderate/loose gauge. Before I blocked it, I ended up pulling yarn from the wrong side here and there to make the stitches look more even. You can see the difference clearly when you look at the front panel. If you look at the red leaf-like pattern, strands are trapped on the right front, but I didn’t do it on the left front. I figured that it looks so much better if I don’t bother doing it. In addition to knitting at a finer gauge to get a smaller sweater, you modified the motifs to affect the row count. Tell us about the changes you made in that regard. And are you happy with the motifs you came up with? Yes. I wanted to make this vest very fitted with zero or negative ease. To avoid looking like wearing a kid’s vest on a women’s body, I made it longer, which is about the same length as the original pattern. I added 10 rows to the lower body, by adding a triangular dot motif and a red line, as well as replacing one of the main patterns. I wanted to replace the geometric box-line motif with something more organic, so I did a lot of Google Image Search to find one that I like. I charted the motif on graph paper, which took no time at all. I am very happy about the result! Did you make any other mods to the pattern? When I began knitting the back panel, I was shocked to realized that some parts of the armhole edge (solid color stripes) require intarsia, and to avoid it I needed to trap the main color all the way across to knit the second armhole. The same situation happen for fronts, all the way from the bottom to the end. I didn’t like the idea of doing intarsia on the front band, where I will be pulling hard all the time, nor trapping the MC yarn where there is nothing else to knit on the other side like the upper back. Which is why I knitted the front band separately, in ribbing. I was a little nervous whether it would work out, but it turned out to be quite easy. I picked up 2 stitches per 3 rows on the straight edge, and a stitch per every row on the neck edge slope (19 stitches). From there, the front collar was shaped by Wrap & Turn — work in rib for 15 stitches, W&T, work in rib to the end, turn, work in rib for 13 stitches, W&T, etc. The other mod I did was to add pockets on the sides. To do this, I left about 4″ unsewn where I wanted the pockets to be, and picked up 22 stitches (11 on each side), worked 18 rounds (4″+), and grafted it together in Kitchener Stitch. It was easy, and I love how it turned out. Watching everyone else knit their vests — both on the panel and in the larger community — was there anything you saw that made you wish you’d done something differently? When I decided to knit the front bands separately, my initial intention was to attach a zipper instead of buttons. To do this, I figured that knitting the front collar by itself then crocheting on the straight edge was the way to go. But that meant I would need to recalculate the front collar. The biggest reason I abandoned the idea was that the body was more fitted than I had expected (though my gauge was spot on — I guess my hips are bigger than I imagined! ), and I needed the button band to add a bit of width. I saw what you did with your vest — I cannot wait to see it finished! If I should knit it again, which is very likely, I will change the main motif entirely, so that changing the size would be more flexible and easier. Perhaps one big motif on the back, and something smaller on fronts. The idea excites me, and I’ve already started thinking about which colors to choose! It seems like we’re all bound for at least one more vest! Thanks so much, Meri! Andrea Rangel is the first of our illustrious panel for the Cowichan-style Knitalong to finish her vest — not too surprising since her swatch was two entire front panels of the sweater! She’s answered some questions for us below about how it turned out, and you can see additional photos on her blog. For more from Andrea, follow her on Instagram and sign up for her newsletter. And I also want to let you know she’s on the brink of publishing a revised, unisex version of her Dude sweater as well as a kids’ version! Would you look at this photo? So keep an eye on her in whatever venue for more news on that! You mentioned at the outset that you had chosen a yarn that was “not one bit” Cowichan-y. And you’ve also knitted this with a single strand at bulky gauge rather than superbulky. How do you feel about the weight and character of the fabric in the end? This is the most important question about this project for sure. I used Rowan Brushed Fleece, which was just this frothy, fluffy puff of a super soft yarn. The gauge is great and the yarn was fun to work with, but I’m still not really satisfied. As I worked I felt increasingly ridiculous for using such an incredibly luxurious, soft yarn for outerwear that I would hardly have against my skin. I’ve decided that, while I do quite like the finished vest, the yarn would be much more suitable for a pullover or neckwear so I could take full advantage of the yummy softness. It would also be more sensible to have a more serious, rugged wool for a vest like this. At the beginning of this project my first impulse was to go with Imperial Yarns Native Twist or Quince and Co. Puffin, and for the next iteration of a bulky vest, I’ll go with one of those (or now that Brooklyn Tweed has Quarry, I might have to try that too). I’ll see how much I end up wearing this vest to determine whether the project was a success or not in the long run. You were also unsure whether you’d be happy with your color choices — what’s the verdict? I like how it looks, but I still feel unsure how much it’ll fit into my wardrobe. The colors are so bold! The next vest will definitely be in more earthy or natural colors. I’m in love with the main motif you came up with — the starburst shape — and they way you’ve positioned it so there’s one centered off each side seam, rather than being centered in the back of the vest. Where did all of that come from? My husband actually helped me brainstorm that one a bit and then we just charted it out. I figured that since I was objecting to the highly decorative look of the motif in the pattern I’d try something totally different. The size also looks fantastic — did you hit your target proportions and are you happy with it? Yes! The size turned out great, pretty much right on the predicted numbers. I expected that it would given my (excessive) swatching — thank you, math! Tell us what all modifications you wound up making, apart from the gauge/size tweaks and replacing the colorwork motifs. I forgot to knit pockets, so I decided I must not have wanted them that badly. But I did round the armholes and add short row shaping to give a nice slope to the shoulders. I also worked the edgings, button bands, and collar with a smaller needle after completing everything else to keep them neat. The collar was improvised rather than bothering with the pattern and it’s a bit slimmer, which I like. For the edgings and button bands, I used a US9 needle to pick up stitches at about a rate of 2 sts for every 3 rows. Then I worked a few rows in garter stitch and bound them off. I made one-row buttonholes, which is my favorite buttonhole method. For the collar, I used the traditional method that I described in the Cowichan q&a. To keep the collar relatively slim, I worked the front collars just to about an inch below the shoulder seam. Then I picked up and worked the back collar with the front flaps. Because this method requires you to join the back collar stitches with front flap stitches until the front flap stitches are used up, the top width of the front flaps (how many stitches you end up with after working the front flaps) determines how tall the back collar will be. If you keep picking up stitches and working the front flaps all the way to the shoulder seam, you’ll have a more generous collar than I ended up with. As you’ve watched other sweaters taking shape on Instagram and Ravelry, was there anything you wished you’d done differently? I was definitely jealous of the Puffin, Native Twist, and Quarry I was seeing. I just love those wooly wools so much! It’s been really fun to see everyone’s take on this and I’m happy with mine, but not so happy that I won’t keep pursuing this idea in other ways. Bulky vests are fun! They really are, and it’s already clear to me there there’s another one in my near future. Do you mind if I steal your starbursts? Not at all! In fact, I just posted my charts on my blog so anyone can use them. Awesome! Thanks for everything, Andrea! We’ve talked about and looked at a lot of Cowichan sweaters in the course of this knitalong, and clearly one of the most distinctive characteristics is that little shawl collar, so important in the blustery Pacific Northwest climate, where a Cowichan is considered outerwear. With our shaping-free, Japanese, Cowichan-style vest pattern, it’s also the most interesting part of the knitting. And also a little bit cryptic. But once you’ve worked it and worn it, you’ll find yourself wanting to knit one on every sweater going forward. Andrea talked in our interview last week about the traditional way the collar is worked, which is a little bit different from how the knitalong pattern has you do it. If you’ve read her description and it makes sense to you, I can’t see any reason you couldn’t do the collar that way on this vest. But I want to walk you through how to do it as the pattern is written. First, let’s review: You knit the back piece, which is just a big rectangle with cutouts for the armholes. Then you knit the two front pieces, increasing gradually toward the tops of those pieces to create a pair of triangular flaps for the front parts of the collar. You bind off the shoulder stitches and keep those top flap stitches live on a holder (while you block your pieces). Once the shoulders are seamed together, you pick up 17 sts across the back neck and from those knit the flap for the back part of the collar. Then you seam the back collar and the two front collar flaps together. For that back flap, you need to scrutinize the pattern. On the diagram, there’s an annotation at one end of the flap that says 9 sts are increased to get the correct finished width. At the other end is the “#-#-#” style annotation that Meri explained for us. It tells you to increase 1 stitch every other row seven times (14 rows), then 1 stitch every row for 2 rows. Again, that gives you 9 new stitches (over the course of 16 rows, followed by 4 work-even rows). In both cases, these annotations are referring to one end of the flap. To get the inverted trapezoid shape and the necessary 35 sts, you need to work those increases at both ends. I’ve written that out another way and in a little more detail here. Once you’ve knitted and bound off that back flap, all that’s left is to seam it together. But wait, you’ve got live stitches for the front collar and selvages on the back collar. What to do?! I had ideas, but I was curious to know how some of the greatest minds in knitting would do it, so I took the sample sweater with me to the trade show last spring and passed it around. All sorts of people weighed in, and pretty much everyone had a different idea about how they would do it (including not having done it this way in the first place). Then Olga Buraya-Kefelian — who I’m always calling “our foremost knitting engineer” — took one look at it, said what she would do, and everyone else said some version of, “forget mine, do what Olga said!” That’s Olga with my sweater in the photo up there, between Bristol Ivy and Julie Hoover, three of the sharpest, most technical knitters I know. This was also when Bristol clued me in about Navajo ply. Olga’s solution seemed simple and obvious once she’d said it, but I don’t mind telling you it was a little daunting to do it with everyone watching — Navajo ply plus this bind-off in a very noisy and crowded hotel lobby after I’d had a couple of drinks. If I can do it under those circumstances, anyone can! It really is simple. All you need to do is take a smaller needle and run it under 18 bumps along the back collar selvage — to match the 18 live sts on the front flap — and knit them together just like a 3-needle bind-off. (If you’re working with yarn held double or triple, make sure you’re picking up the whole stitch and not just one strand of it.) This is garter stitch we’re dealing with, 20 rows or 10 ridges, making it easy to pick up the 10 bumps at the ends of those ridges, so you just need another 8 sts from the gaps in between. It doesn’t look very pretty, as you see in my photo up there, but it works out! Keep in mind that a ridge will form where you do the 3-needle bind-off seam, so you need to think about whether you work it with right sides or wrong sides together, depending on whether you want that seamline to show on the front or back of the collar. I chose to have it exposed, so I knitted them together exactly as they’re pictured above, with right sides (or outsides) facing me. If you haven’t done a 3-needle bind-off before, it’s simple: You insert your working needle into the first stitch on the front needle and the first stitch on the back needle, then knit them together. Work the next stitch the same way and pass the first one over to bind it off. Then repeat to the end of the row, working the stitches together and passing the previous one over. Tada! As promised, today I have a discussion with our Cowichan-style knitalong panelist Andrea Rangel about what a Cowichan sweater is and is not, pop-culture and mass-market appropriation of the style, and whether there’s anything wrong with knitting a sweater in the Cowichan style. There’s been a lot of discussion around all of this since the knitalong kicked off and I’m happy to see so much interest. Andrea is not Coast Salish herself, but has lived in the Cowichan Valley and spent time studying the Salish people and their sweaters, with their influence having made its way into her design work. Her most recent pattern happens to be a Cowichan-inspired pullover vest, Tokul, and she’s also the first panelist to have completed her knitalong vest — so I’ll have her FO interview and pics soon! In addition to the links previously provided, Andrea has posted some videos on her Instagram feed showing how she traps floats, which she says is not 100% the Salish way, as they would typically hold both yarns in the right hand. But whether you’ve watched the videos mentioned in the links roundup post, take a minute to watch Andrea’s as well. And one more link to mention, shared by Eliana in the comments: Cowichantribes.com, with contact info for Cowichan craftspeople. For those who’ve wondered how to buy an authentic sweater directly, that might be another path! I also want to say a big thank-you to fellow panelist Kathy Cadigan for the photos included in this post, which she shot three years ago when touring Cowichan Valley with Andrea (which you can read more about on Tolt’s blog). The photos were taken variously at the Duncan farmer’s market, Leola Witt’s weaving studio, and Hill’s trading post. Note that the photo up top is not of authentic Cowichans, but of a Sylvia Olsen vest design, samples knitted by Andrea (left) and Sylvia (right), which I thought you might like to see. (Sylvia considers her own design style to be a fusion of influences from her own Scottish/English ancestry and Coast Salish ancestry of her former husband.) The sweater Andrea is modeling above is a vintage Cowichan, likely from the ’50s, and belongs to Witt. Hopefully all of this will add to your understanding and appreciation of the Cowichan tradition! What’s the most basic, one-sentence answer to the question “What is a Cowichan sweater”? A Cowichan sweater is a sweater knit by a person with Coast Salish heritage that is generally made with undyed superbulky-weight yarn and often features some color patterning. Coast Salish people are a group of indigenous people from the Pacific Northwest Coast, including Washington, Oregon, and British Columbia, who are ethnically and linguistically related to one another. What are some of the key characteristics that make a Cowichan sweater a Cowichan sweater? – often featuring three sections of colorwork — narrow bands at the hips and shoulders and a wider band across the chest. – a characteristic collar worked in three sections. After both front sections are worked, stitches are picked up along the back neckline. At the end of every row of the back collar section, a live front collar stitch is knit together with the last back collar stitch. When all the front collar stitches on both sides are gone, the collar is complete and can be bound off. Also, in order to avoid long strands at the back of the work as well as to manage tension, floats are caught every other stitch. This is apparent on the inside of the sweater, and you can often see it a bit on the public side too — the contrast color will often peek through a bit. A blend of intarsia and this catching-every-other-stitch method is also frequently incorporated if there’s just one big motif – like an eagle on the back. The sweater pattern we’re knitting for the knitalong is a “Cowichan-style sweater” because it doesn’t have the right ethnic or geographic origins to be called a Cowichan sweater, but what other ways does it deviate from the true Cowichans? Cowichans are a little like the lopapeysa in Iceland (aka lopi sweaters), where you have local guilds knitting these indigenous sweaters to be sold largely to tourists. Right? The lopi apparently only dates back to the mid-20th century. How old is the Cowichan sweater tradition, and also: Tell us how it is that you come to know so much about all this. I’m not quite as familiar with the history of Icelandic knitting, so aside from the sweaters being knit for tourists, I don’t know how similar the traditions are. Historically Cowichan sweaters were sold directly from knitters’ homes (often hung in the yard so that passersby could see them), but I haven’t heard of that happening recently. It’s possible to get a genuine Cowichan sweater from Hill’s Native Art in Duncan, BC. These include a Cowichan tag and often the name of the knitter. During summer months you can also find knitters knitting on the waterfront with sweaters and accessories to sell, so in that case you’re buying directly from the knitter. There are a couple other shops in downtown Victoria that sell native art including Cowichan sweaters, but I don’t know how much of the profit goes to the artists and knitters or how authentic the products are. Coast Salish people had a long tradition of weaving, but started knitting around the time that British Columbia was colonized, in the mid- to late-1800s. The current idea of the Cowichan sweater has been developing and evolving since then. I’ve learned about this tradition mostly because I moved to the Cowichan Valley a few years ago and was very curious. I had the opportunity to meet and talk with Sylvia Olsen, the author of Working with Wool and Knitting Stories, who also lives in this region. She has a fascinating personal history with this tradition and has researched and written about it in a wonderfully poetic and scholarly way. Working with Wool should be the primer for anyone interested in learning about Cowichan knitting. So what we’ve got here in our knitalong sweater is a Japanese take on the Cowichan sweater. It’s become a fairly common style to appropriate, but the Japanese seem particularly taken with it. I’m asking you to generalize here, granted, but how do the Coast Salish people feel about their knitting tradition being co-opted by other cultures? I can’t speak for Coast Salish people, but as far as I know, they object strongly to anything being called a Cowichan sweater that isn’t one. One thing that’s been mentioned a few times since we kicked off this knitalong is the collaboration between two Canadian companies — Roots and Mary Maxim, both of which are new to me — to produce “Cowichan” sweaters. (Mary Maxim was apparently founded in the ’50s on patterns for sports-themed faux Cowichans.) Whether or not either company actually calls them Cowichans, the sweaters are clearly indebted to the native knitters, who in no way benefit from this mega-brand collaboration. What’s your feeling about appropriation of knitting traditions, especially with regard to Cowichan? And is there anything wrong with non-Salish knitters knitting themselves a sweater that’s Cowichan-inspired? I’m glad you raise this question. I think it’s an important topic and I think you could get a lot of different opinions. I wish we had a Coast Salish knitter here to speak about this because I’m not sure how she or he would answer. Labeling a sweater as “Cowichan” or even “Indian” (a term that was historically used before Cowichan to describe the sweaters) when it isn’t is a violation of the creative and intellectual property of the Coast Salish. And we have to acknowledge the historical and current cultural oppression and racism that continue to have a negative impact on the Coast Salish community. That history and current reality have to inform our thinking about this topic, and I think it’s vital that we take special care not to exacerbate the disenfranchisement of that community by claiming their cultural property as our own. But I also think that fashion is always in flux. We are all constantly inspired and influenced by what we see around us. In the United States, you can’t copyright a clothing design and I actually think that’s sensible – there are so many elements to a piece of clothing that it seems nearly impossible to boil down its essence and say that someone owns that. (Is it the pattern of the fabric? the fiber content? the cut? the techniques used to create it? the placement and number of pockets?) To say that any item of art or culture is 100% original or pure is nonsensical to me – all of our creations are iterations of something else. I find power and beauty in that connection back to our mothers and grandmothers and back and back. We are all interrelated and the huge variety and mixing of knitting traditions are a wonderful visual and tactile representation of that. I don’t think there’s anything wrong with knitting a Cowichan-inspired sweater. I’d love if there were patterns available from Coast Salish knitters so we could also be supporting that community, but I have yet to find any. And I think there would most definitely be something wrong with a non-Salish knitter claiming that their sweater was a Cowichan, particularly if they used that label as a sales tactic. 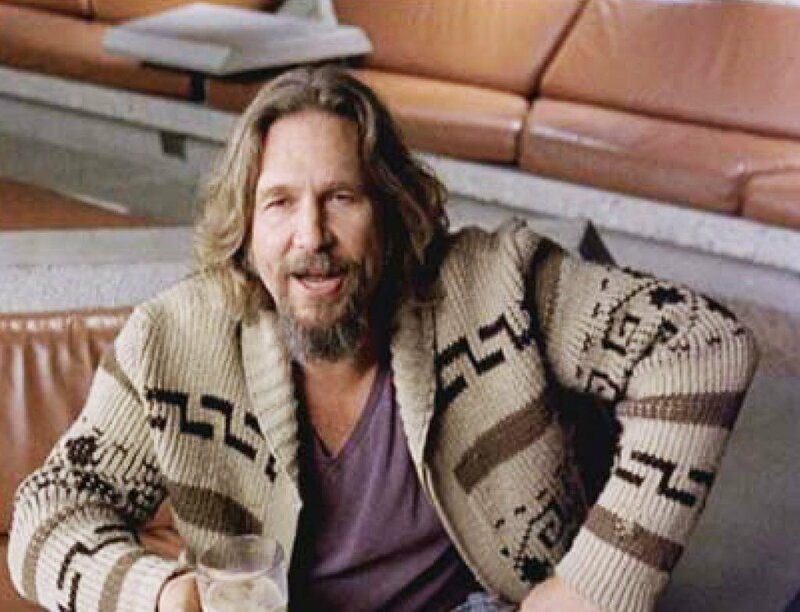 One of the most famous Cowichan-style sweaters in pop culture (along with Bob Hope and Marilyn Monroe) is the one worn by Jeff Bridges — aka “the Dude” — in The Big Lebowski. It’s not the most flattering portrait of a garment, and yet that sweater became iconic. (And you actually published a knitting pattern several years ago for the Dude’s sweater.) Do you think the fame or infamy of that sweater did anything as far as raising awareness of the Coast Salish people and their traditions, knitted or otherwise? Or do you think people even thought to wonder about it — it was just a cool sweater. 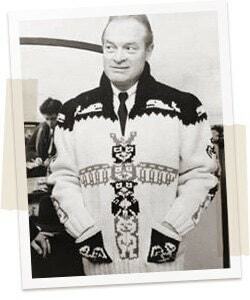 That is a great sweater and it was definitely heavily influenced by the Cowichan sweater tradition. I think it’s a great example of how fashion works — we’re influenced by what we see and like and then alter it to suit our own market, aesthetic, or to achieve other goals. Because it was called a Cowichan sweater (though there are so many ways in which it is not), I think it has generated interest in the Cowichan knitting tradition among knitters and people interested in the history of fashion. Most folks, though, probably just think it’s a cool sweater.